Our one star holiday home offers stylish and spacious interiors at unbeatable value. The generous, open-plan living area has an instant, welcoming appeal and features a fully vaulted ceiling, single glazing, stylish cabinetwork, a contemporary gas fire and attractive, softly toned furnishings. The floor plan is for illustrative purposes only. 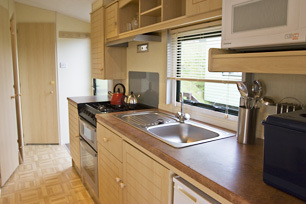 This floor plan and the pictures above are of one of the 1-star caravans sited at Pettycur, but please note there are variations in design and layout within the same hire class, and not all models are identical to those depicted. To hire this caravan, choose when you want to visit from the options shown below. Pre-authorisation by credit card deposit is required on arrival as security for all incidentals, extras and damage that may be incurred during your stay. Linen and Towels - Please remember to bring your own. Pets - We regret that pets cannot be accommodated in our holiday hire homes. Entry - From 15:00 on day of arrival to 10:00 on day of departure. Disabled Access - Please state if you require this when making your booking. Please read our full Terms and Conditions prior to making your booking. Online payment is via RBS Worldpay; we accept Maestro, Visa Credit/Debit, JCB and Mastercard. Book online for our best discounted price - or by telephone or mail: brochure price.